You may remember when I told you about my StickyGram magnets. Well, now you guys have a chance to win some! I am really, really excited about this giveaway. Before I go into too much detail, let me tell you a bit about StickyGram. 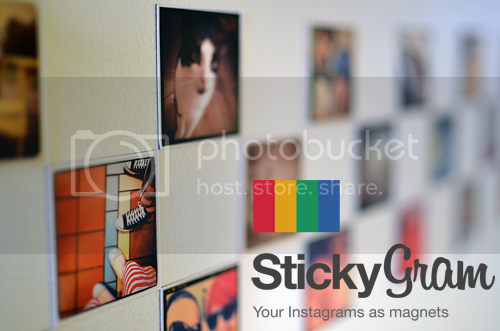 StickyGram is a really cool company that allows you to turn your Instagram photos into magnets. I was so pleased with the magnets I received from StickyGram. They were great quality, made my photos look even cuter and (possibly the best part) shipping was FREE and super speedy. Usually when I hear "free shipping' I'm like, "oh, that probably doesn't apply to me because I'm in Canada." But it is free international shipping so it does! Hooray! I love having the option of turning my Instagram photos into magnets that I can display on my fridge. The cats really like seeing themselves up there everyday ;). So, now onto the giveaway! This giveaway will be a little different. In order to participate you must be able to use Instagram, which is a free app for anyone with an iPhone. We will be holding a little photo competition with the theme "Hobbies". Using Instagram, take a photo of something that represents one of your hobbies. Make sure you tag your photo by typing the following in your description: #loveelycia. Make sure the tag is included so that I can see your photo. You can enter as many times as you like with different photos as long as they are all hobby related. There will be THREE winners that I will choose based on my three favourite photos. 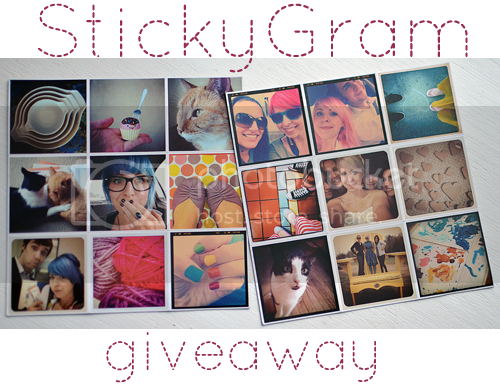 The winners will be announced two weeks from today on November 17th and will each receive a free set of StickyGram magnets! Even if you aren't able to use Instagram you can still see the photos that people are submitting by visiting Gramfeed and typing 'loveelycia' into the search box. I am so excited to see all of your photos and I will be featuring some of my favourites on my blog while the competition is going on. Are you guys as excited about this as I am? Good luck and have fun! Best idea ever! How fun! Elycia I LOVE this!! Do the pictures have to be new starting from today, or can we tag previous pictures that show our hobbies too? best give away ever? yeah. i'm going to find a million hobbies. jk. but seriously. my fridge needs some fun shiz going on, it's too boring now. ooh this is so exciting! i cant wait to participate! jamie, i hadn't thought about that. I guess tagging previous photos works too! I'm glad you guys are excited! I did it wiht my ipod touch.Anyway yey!this is so nice! Going tag crazy! Okay, I stopped after 4 and my 'hobby' is a bit non-traditional, but it's how I spend my free time!